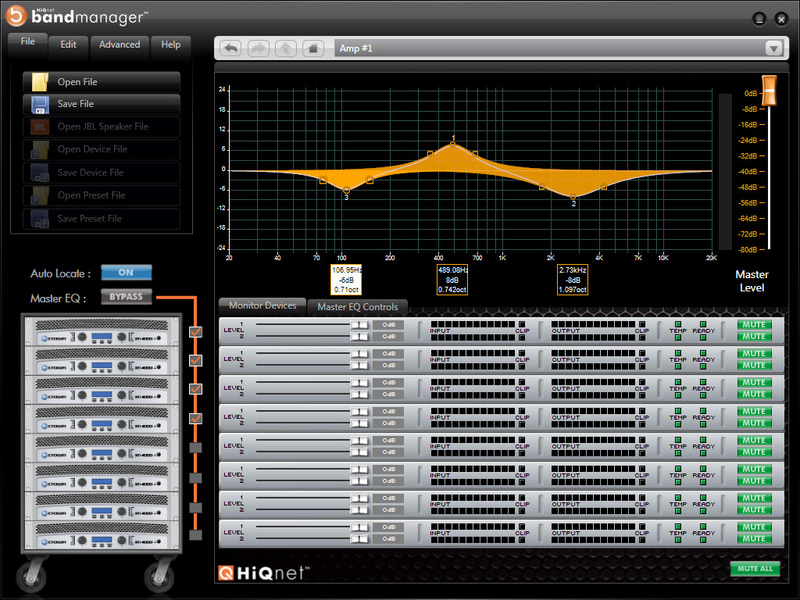 HiQnet Band Manager currently functions with the original Crown XTi Series and the latest Crown XTi 2 Series amplifiers. This software allows you to turn loose the power of your Crown amplifiers while greatly simplifying system setup and management. This is the second version of Band Manager which includes support for the Crown XTi 2 Series amplifiers and a number of new amplifier preset files for JBL loudspeakers. Band Manager 2 gets your amps configured with more speed and less work because it is tailored specifically to portable systems. Once the software has automatically discovered up to eight USB-connected XTi or XTi 2 amps, represented in a virtual rack, the included JBL speaker tunings can be easily loaded into each amplifier. Band Manager 2 features a sleek function-driven interface and intuitive browser-style navigation. The home screen automatically configures and displays monitor strips for each amp in the rack plus front-of-house EQ and level control and allows you to quickly access each amplifier's processing. Once you have set up your system, the amp settings can be saved for quick front panel recall.